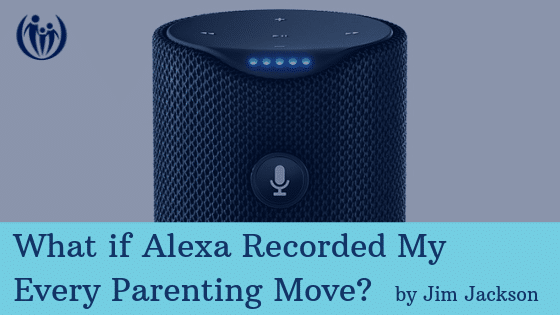 What if Alexa recorded my every parenting move? For some reason, I have always behaved my best when people watch me, unless those people were my kids when they needed discipline. That’s when my ugliness most commonly emerged. While God has helped me grow and change, even today I’m still inclined to be at my worst with the people I love most. This is true for most people, but why do we do this? I tend to act my worst with my wife and kids because I believe I have little or nothing to lose with them. I am safe with them. I know they will keep loving me even if I act badly. In other words, I’m inclined to take the people I love the most, and their unconditional love for me, for granted. Lynne and I keep working this out as we grow, and are getting better with time at confronting, confessing and reconciling well. After 32 years we’re at our best far more than we’re at our worst. But since this is a parenting blog, let’s talk about how this played out with our kids. Lynne and I worked hard to describe the kind of parents we wanted to be. We came up with four key ideas that became a framework that guided us. The ideas were so easy to remember that I could actually think of them when my kids’ behavior was unruly. When we decided these ideas would drive our parenting, we did two things to help hold ourselves accountable: we communicated them clearly to our children and we allowed our children to respectfully call us out if we weren’t staying true to our parenting goals. I often imagined that my parenting was being recorded. And these days, who knows….maybe it IS being recorded by my Alexa, or Siri, or Google. 🙂 I have to confess: the thought that my parenting was being recorded helped me remember to be the parent I wanted to be, and continued to motivate me to do better. 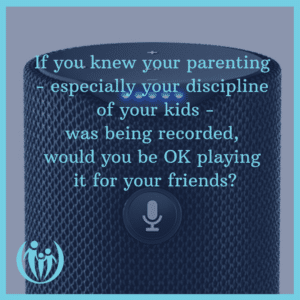 So I ask, if you knew your parenting – especially your discipline of your kids – was being recorded, would you be OK playing it for your friends, or on the big screen at church? It’s a scary thought! If you are feeling overwhelmed, take heart. It’s never too late to become a parent with a plan. What is one thing this year you want to pursue in your search to be a more confident, peaceful parent? Would you be willing to share that plan with your kids? Frustrated by constant discipline challenges? Take 15 minutes to read our free ebook 4 Messages All Children Long to Hear: A Discipline That Connects Overview. Your ebook is being delivered to your inbox right now! Members of our mailing list receive one power-packed, grace-filled email per week. We hate spam & never sell our list.